Ollie Caswell came within a whisker of a half century as Woodhall Spa CC were beaten at Boston. The two teams agreed to begin their Lincs ECB Premier contest early so they could finish in time to watch England’s World Cup quarter-final victory over Sweden. But by then the Spa men had suffered a seven-wicket defeat at the Mayflower. Caswell led the way for Woodhall with his 49 runs, supported by Joe Irving (32), Jack Hughes (27 not out), Harsha Vithana (16) and James White (12 not out) as Woodhall posted 178-8 off their 50 overs. However, Boston reached a winning total of 179-3 in the 43rd over, Jonny Cheer (77 not out) and Ishan Jayaratne (56) doing most of the damage. Irving, Prasanna Jayawardene and Ross Dixon took the Boston wickets. 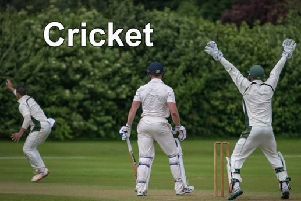 Woodhall sit fourth in the Lincs ECB Premier and return to action on Saturday as they host Alford and District (noon). Woodhall Seconds secured a 124-run victory over South Lincs and Border League Premier Division title chasers Sleaford Seconds on Saturday. Connor Parsons was the star of the show as he struck an unbeaten 96 at Jubilee Park as the hosts ended their innings on 280-6. Danny Wells (55), Sam Cherry (38), Mathew Sargeant (19) and Peter Jackson (13) added support. Sleaford were all out for 156, Parsons, Kieran Richardson, Jackson and Sargeant all claiming two victims. Matthew Haslam also took a wicket against 10-man Sleaford. This Saturday the Seconds are away at Billingborough. On Sunday the Wanderers Seconds host Sleaford Sunday Seconds (1.30pm).